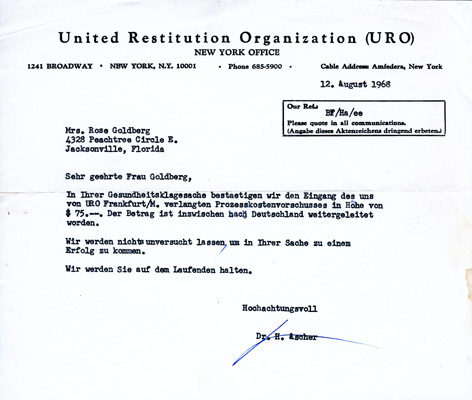 This letter from the United Restitution Organization's New York office, dated August 12, 1968, confirms that the organization has received the $75 which its Frankfurt branch had requested as an advance payment toward the cost of the trial involving her health claims. The money has been transferred to Germany. The letter ends with the assurance that that the organization will do all it can to resolve the matter successfully and will keep her informed. It is signed by Dr. H. Ascher.